For many of us who have been in the industry for many years, this type of finding is hard to take. As I wrote in a 2015 piece titled Say It Ain’t So, Joe, sometimes I feel like the little guy in the movie “Field of Dreams”. Until founding Fiduciary Wealth Partners in 2012, I spent my career promoting actively managed funds. I believed in them. I was quite good at selling them. I received an award one year for selling record amounts of active equity for the firm I worked for at the time. Like the little boy, who had learned of Shoeless Joe Jackson’s involvement in throwing the 1919 World Series, negative news about something we have believed in for many years is hard to take. In the past, active management was the only game on Wall Street, and managers with hot hands were put on pedestals. Many of us grew up in an investment world that was dominated by reports of star active portfolio managers such as Warren Buffett or Peter Lynch. Like most anyone, I believe that people who work harder should have an advantage. As with many things, however, it is not all about working harder. You need to work smarter, not let emotion get the better of you, and stay focused on the evidence about what works consistently over multiple long-term periods. What does the evidence now consistently show? I’ll keep this short and simple this time, however, and just finish with a 2016 quote from another well-respected data analysis firm, Morningstar. Yes, it’s hard for many alpha-oriented investment personalities such as me to swallow, but the evidence in favor of index funds is real and consistent. Stay it ain’t so, Joe. Say it ain’t so. What Would Yale Do If It Was Taxable? Yale is among the finest learning institutions in the world. It is known for many great things, but in the investment world it is probably best known for its top performing endowment, which many try to replicate with what is called an endowment model. What can individual investors learn from the Yale endowment? Maybe how to not invest if, like most individuals I know, you have to pay taxes. Over the past 5-10 years, I have seen a large increase in firms selling ultra-high-net-worth investors (individuals and families who have liquid investible assets excluding real estate of $50 million or more), endowment style investment portfolios and limited partnership fund of funds. Why might this initially appear to make sense? Many ultra-high-net-worth (UHNW) investors have no debt, consume a small portion of their assets for annual expenses, and are really investing for future beneficiaries or to be able to give more in the future to charity. Some have even set up trusts in jurisdictions like Delaware that allow family trusts to run for more than 100 years (so called dynasty trusts). Because of this, UHNW investors commonly view their time horizon for family trusts in generations, not years or decades. What does a trust that is investing over a very long-term timeframe for the benefit of generations to come sound like? Maybe an endowment? If some UHNW trusts have characteristics that resemble endowments, and Yale is arguably the best endowment, shouldn’t more UHNW portfolios look like Yale? Every endowment approach I have ever seen has one thing in common with its peers: a sizable allocation to hedge funds. A great deal has been written in academic studies and the media about the high fees associated with hedge funds. More is also starting to surface about hedge fund performance as compared to low cost, simple, diversified portfolios of index funds that have the same historical risk adjusted returns and volatility (feel free to reach out to us for our analysis of this – my hedge fund friends might de-friend me if I post it publicly). Not as much has made the press, however, about what really makes UHNW investing different than endowments, namely, taxes. Yes, taxes. Regardless of your political leanings, no one likes writing a big check to the IRS, but the IRS is a fact we cannot avoid. Recent tax law changes have made the subject of taxes even more important as it relates to investments. Tax law changes that became effective January 1, 2013 include a top short-term gain rate of 39.6%, a long-term gain rate of 20.0%, an additional 3.8% tax on net investment income (the Medicare tax) and an effective additional 1.2% rate increase due to the phase-out of deductions for top-bracket taxpayers (the Pease phase-out). All of this combines to create a 44.6% tax on short-term gains and ordinary income, and a 25.0% tax on long-term gains and dividend income. And this is only taking into account federal taxes. Many states such as California, which has one of the largest collections of UHNW individuals in the United States, impose a substantial additional tax burden. When I am helping UHNW investors free up funds around tax time to pay bills due for large realized gains on hedge funds, I often raise words of caution about these investments. Endowment model investment presentations, which normally include sizable allocations to hedge funds, are complex, well done, and often presented by well educated and well heeled professionals. The pitches can be impressive and hard to resist. What they often do not point out, however, is that allocations to hedge funds often generate large short-term gains, which now carry with them a 44.6% federal tax or reduction of return for taxable investors. So, what has made me write of this subject now? Well, the dreaded April 15th tax date is upon us soon, so conversations about this subject with our UHNW investors are top of mind. In addition, credit must be given to a tax aware investment firm in California, Aperio Group. I shamelessly took the title of this post from one of their recent papers. The full research report can be found at the link below. What Would Yale Do If It Were Taxable? Inspiration also comes from the long-time Chief Investment Officer of the Yale endowment, David Swensen. Swensen is considered one of the most successful investors in the world and, based on his use of non-traditional investments such as hedge funds, a major contributor to the endowment investment model. Following thoughts from Swensen’s first book in 2000, Pioneering Portfolio Management, many UHNW advisors started promoting the endowment model. The UHNW investment world eagerly embraced this new “sophisticated” approach and yet, going on 15 years later, still seems to be forgetting the fact that Swensen’s book was designed for tax-exempt investors. Even though Yale has generated top returns for its beneficiaries through the use of hedge funds, what does Swensen, like many other successful investors such as Warren Buffett, suggest for taxable investors? Swensen’s quote is powerful and is book is very well done. When you have time, I encourage a read (see the link below). What Aperio has done better than almost anyone else I have seen is provide sophisticated evidence to counter some of the sophisticated endowment style presentations. Their research suggests that when you properly account for the tax drag, hedge funds should have little, if any, place inside taxable portfolios. As we try consistently to do, versus going on our about own views, below are quotes and charts to consider from the Aperio research. Aperio uses the term Absolute Return as a proxy for hedge funds. Notice the allocations to Absolute Return and even to more traditional active equity managers in the “yellow” and “blue” shaded columns. Yes, if you look carefully at the chart, the Aperio research suggests that you should have zero allocation to active managers and hedge funds, and this assumes that you only have hedge funds with low correlation to equities, which provide diversification benefits. Many hedge funds have relatively high correlation to equities (a well respected hedge fund index, the HFRI Fund Weighted Composite has a 0.88 correlation to equities), which makes the case against using them for diversification even less attractive. Below is a quote from Aperio on the results of their analysis when using hedge funds with high correlation to equities. Versus just modeling Yale’s portfolio, Aperio also used data from the previously mentioned Commonfund and NACUBO study of all U.S. endowments. Below is a chart and quotes from what they found using this approach. Where does this all leave us as it relates to the title of this blog? First, as is always the case, the assumptions that Aperio or any other researcher uses are key. I have looked at the research in depth and believe the underlying assumptions are reasonable, but as with anything, results will vary based on the actual investments that anyone might make. Second, the Aperio research does suggest that if you use tax-effecient index strategies, such as the ones that they provide, you can allocate more to certain types of hedge funds that have low correlation to equities. I am a little suspect, however, about how much value can be added in terms of tax efficiency over and above the extreme tax efficiency of index funds, but I welcome feedback on this, and encourage you to read the full Aperio report yourself. Finally, if you are a taxable investor, don’t be sold complex strategies that don’t factor in taxes. All of this continues to lead us to recommend that all investors, small and large, maintain a high percentage of keep-it-simple, low fee, fully transparent, tax efficient investments. What types of investments should more UHNW investors use to try to achieve solid returns like Yale? The evidence continues to point to index funds. * In the Aperio research, bonds are assumed to be taxable for the pre-tax allocation and tax-exempt municipals for the after-tax portfolios. All distributions from tax-exempt bonds are assumed to be tax-exempt, i.e. possible capital gains are ignored. For those who are movie buffs, you will recognize the title of this blog from “Field of Dreams”. The phrase refers to 1919 Chicago White Sox, who unfortunately became known as the Chicago Black Sox. Many players on the Chicago team were accused of taking money from bookmakers to throw the World Series and were banned from baseball. In the movie, when a little boy was talking with a Chicago player that he looked up to, “Shoeless” Joe Jackson, he said, “Say it ain’t so, Joe”. The news about someone whom the child had put on a pedestal was breaking the boy’s faith in baseball and he was hoping Joe would say the reports were not true. How does this relate to a blog from an investment guy? In my last blog, “Is Trying to Pick Active Managers a Loser’s Game?”, I mentioned this line and, as I was expecting, it has come in for some criticism. It is hard for many to believe what the numbers show: that index funds outperform most actively managed strategies. For many years, active management was the only game on Wall Street and managers with hot hands were, and still are, put on pedestals (see the link to Warren Buffett’s advice below). Many of us grew up in an investment world that was dominated by reports of star active portfolio managers. For me, moving beyond this has been particularly hard. I spent the majority of my career successfully promoting and selling active management. I believed in it and was good at it, rising to be a Managing Director and receiving awards from the Chairman of my firm for record sales of active strategies. I have even written pieces on subjects such as how to find talented managers using tools such as Active Share (more on this in the future). 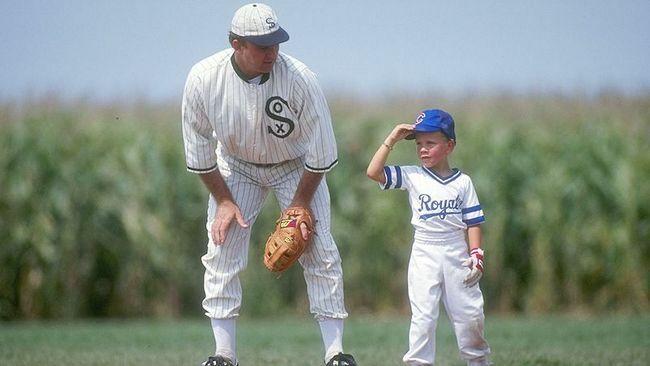 Sometimes I feel like the little guy in “Field of Dreams”. I fundamentally believe that people who work harder should have an advantage and, even though I am now am convinced, a part of me still wants the answer to be different when research compares active managers to index funds. As with many things, however, it is not all about working harder. You need to also work smarter, not let emotion get the better of you, and stay focused on solid evidence about what consistently works over long-term periods (please notice the use of the words long-term). In the world of investing, this has made me a believer in so-called evidence-based investing which, based on long-term evidence, is biased toward index strategies. I could write much more about this but, versus presenting only my ideas, I encourage you to take a look at the evidence yourself. At the end of this post, I have listed a few links to recent articles and research on this subject. You can find other pieces on our Fiduciary Wealth Partners Pinterest website, which we are experimenting with as a place to post articles. If you have others articles or research papers on this point, please let us know and, as always, we welcome data that gives the other side of an argument. Charts often tell a story best, so I include the following table from a 12/31/14 comprehensive study done by S&P Dow Jones Indices. 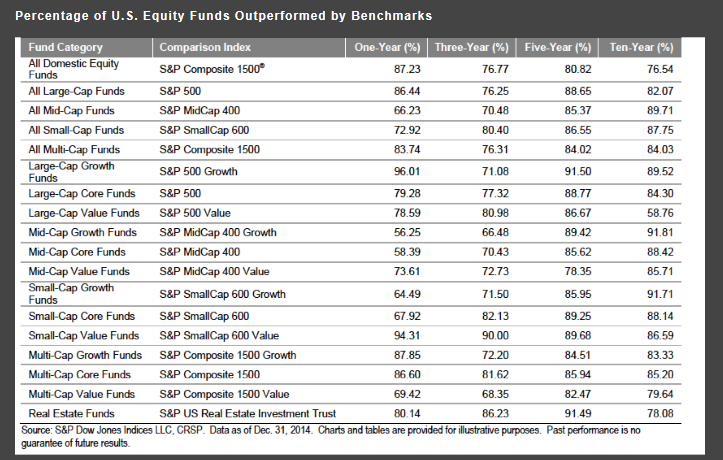 It illustrates the percentage of U.S. equity funds that underperformed their appropriate benchmark index (a link to the full report is at the end of this post). Based on data as of Dec. 31, 2014, 86.44% of large-cap fund managers underperformed the benchmark over a one-year period. This figure is equally unfavorable when viewed over longer-term investment horizons. Over 5- and 10-year periods, respectively, 88.65% and 82.07% of large-cap managers failed to deliver incremental returns over the benchmark. The returns of 66.23% of mid-cap managers and 72.92% of small-cap managers lagged those of the S&P MidCap 400® and the S&P SmallCap 600®, respectively, on a one-year basis. Similar to the results in the large-cap space, the overwhelming majority of mid- and small-cap fund managers underperformed their benchmarks over the longer-term horizons as well. It is commonly believed that active management works best in inefficient environments, such as small-cap or emerging markets. This argument is disputed by the findings of this SPIVA Scorecard. The majority of small-cap active managers consistently has been underperforming the benchmark over the full 10-year period as well as each rolling 5-year period, with data starting in 2002. The lowest percentage of outperformance by active mangers has tended to occur in the best-performing asset classes. Among the nine U.S. style categories, mid-cap growth was the best-performing asset class over the past 10 years, with the S&P MidCap 400 Growth returning 10.03%. However, it is also the category where the highest percentages of managers (91.81%) have underperformed. International and emerging market equity indices posted negative returns in 2014. During the same period, the majority of the active managers investing in international, international small-cap, and emerging markets equities fared worse than their benchmark indices. Say it ain’t so, Joe. Say it ain’t so.